You’re losing weight at a nice, steady pace, and things are going well...then all of a sudden, the scale doesn’t budge. For a week, maybe two or longer, you don’t see your weight change, even though you know you’re following your eating and exercise program. Are you stuck at that weight forever? Time to panic? Not at all. 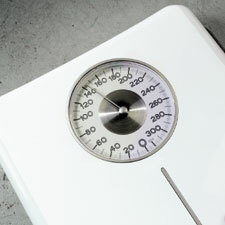 You’ve probably just reached a plateau, part of nearly everyone’s weight-loss odyssey. Generally, in the first few weeks of any reduced-calorie eating plan, you’re able to shed pounds more easily because you’re getting rid of excess water as your body breaks down fat. But once that extra water is gone, the weight loss can slow down, because you don’t have as much fat to lose. Consider it a sign of success: you’ve completed Phase I of your weight loss. Hold steady for a week or two, and you’ll probably be right back in the losing corner. * Write down everything you eat in your food diary? * Add up the calories daily? * Get some sort of programmed exercise most days of the week? * Write down your exercise in your activity log? * Check your portion sizes, using measuring tools if necessary? Review your food diary and activity log. Are you consistently forgetting to list some items? Do your comments reveal something else at work—say, feeling depressed or stressed? If so, addressing those feelings might help take you out of the plateau. Get out of your rut. Try a different exercise routine—maybe a dance class or a swim in a local pool. Add intervals to your workout (alternating regular pace with a faster pace). Invite a friend to come along on your next walk, for fresh perspective. Try a new fruit or vegetable next time you’re at the supermarket–or experiment with some new recipes. Talk with someone who has been there. Know a successful weight loser? Chances are he or she reached a plateau, too, and overcame it. Compare notes, and you just might find a tactic that works for you, along with a healthy dose of inspiration. Lower your calorie goal slightly—by 75 to 100 calories or so a day, as long as it doesn’t bring you below the safe minimum of 1,200 daily calories. Try eating one less serving of a starchy carbohydrate food like white rice or potatoes, or cut out an “extra” like half-and-half in your coffee (or that pat of butter on your muffin). Bump up your activity a little. For many, this is easier than cutting calories—and it might boost your energy and mood too. Try some “lifestyle exercises,” or add five to 10 minutes to your programmed exercise routine. Or, if you aren’t doing it already, add strength-training sessions to your fitness routine a couple of times a week. Get more out of your food diary. Use the “Notes” section to write what’s going on and how you’re feeling when you eat. Do you find yourself craving potato chips when you’ve got a big report due? Spooning ice cream from the container when a “good” friend snubs you? Track what you’ve written, and you might see a pattern. Eventually, you’ll be able to link what’s going on in your mind with what’s going on in your belly. One proven plateau-buster: For one week, eat only foods for which you know the calorie content. Do not eat any restaurant or take-out food, whose calorie counts are unpredictable. Use your measuring cups and spoons so you know exactly what you’re getting, and write down the numbers faithfully in your food diary. It’s a bit obsessive (that’s why we only recommend one week) but it works!